The villa is situated in St George (Agios Georgios), amongst banana groves in the beautiful Sea Caves area of Peyia and just a short drive away from Coral Bay Beach. A short walk or 1 min drive away from the exclusive Cap St George Resort & Maniki beach & you too can share the same coastal & mountain views that millionaires enjoy! The area boasts one of the most exciting & beautiful coastlines in Cyprus, the start of the Akamas Penninsula, a conservation area. The villa is well equipped and furnished to an excellent standard. It's offered inclusive of air-conditioning charges and includes a welcome pack. 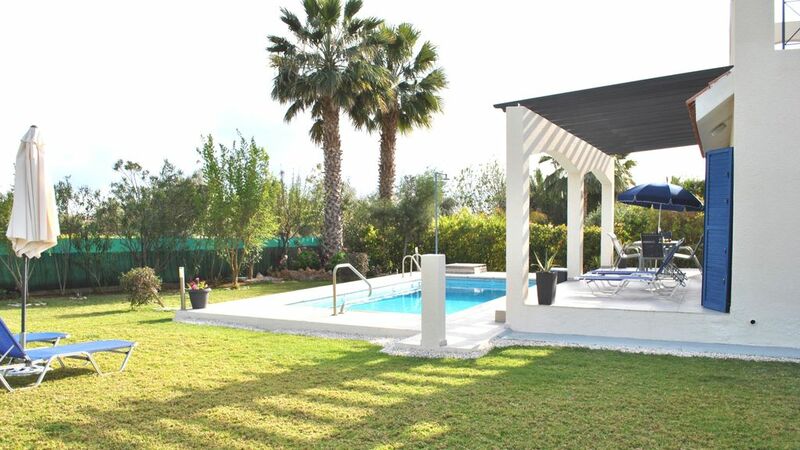 Relax on the terrace, sunbathe by the pool and enjoy the large enclosed garden. For days at the beach we also provide a cool bag, ice blocks & beach brolley. Within walking distance there is a very good & reasonable traditional family run Cypriot Taverna 'Sunset', a Cypriot Fish Tavern overlooking St George harbour and a pub/restuarant 'Searays'. Staying in this area and a must restaurant visit is 'Viklari, The Last Castle'. This restaurant is only open for lunch & only serves traditional Cypriot BBQ. It's perched high at the start of the Akamas & enjoys the most amazing views. 'The Last Castle' is a 5 minute drive from the villa into the Akamas. For a more lively evening Coral Bay abounds with restaurants & bars and serves almost every cuisine under the sun. St George harbour/beach & some secluded beautiful beach bays popular with scuba diving enthusiasts and bathers alike are within walking distance, although also true in July/August a short walk is a hot one! Coral Bay beach and Corallia beach are only 4 minutes drive away. The Akamas penninsula & Lara Bay are a short drive too, there you can explore the wildlife and swim at the sunny and lonely beaches. During July & August you may also be fortunate enough to see turtles. Towels, a few loo rolls & hand soap are included. Large drive that will accomodate any hire car and free off road parking too. The large open-planned lounge and dining area is very comfortable with ample soft seating and a large dining table. Two double patio doors open onto the terrace, pool and gardens. JBL speaker to connect to your devices. A range of family DVDs included. Both the Master bedroom and Bedroom 2 open onto a large balcony with Sea and Moutain views. Speed boat hire is available at Coral Bay, Paphos Harbour, Polis & Latchi. There are also numerous tour boat trips available. The poolside patio is part covered, has table/chairs perfect for enjoying lunch/dinner al fresco! It also accomodates a couple of sun loungers. The smaller patio, perfect for breakfast or a cuppa! In winter the Troodos mountains resemble Narnia, with skiing & ski lift. The closest tennis court hire is at the Coral Beach Resort in Coral Bay, 4 min drive away. Other courts can be found in Geriskipou, 30 min drive away. The closest golf courses are Minthis Hills (Tsada) & The Elea Estate (Paphos), both within 20-30 mins. Aprodite Hills & Secret Valley Golf courses are located on the outskirts of Paphos, a further. The swimming pool, 8 x 4m has roman steps and a hand rail to assist those not so confident swimmers, young and old. The deep end is 2.1m and shallow end, 1.3m; ample for a family holiday. Thank you for your review Kevin. And thank you for leaving the villa so super clean. It was our pleasure hosting you and your family. Superb accommodation in a great area for families and lovely hosts. Just gotten back from a week here and thoroughly enjoyed every minute. Took my 3 boys aged 12-17 and it had something for all ages. The hosts were lovely and treated us really well with some really nice personal touches which made the stay even more enjoyable. I'd recommend the villa to anyone especially families as it has all you need for a stay in the area. It was really well presented and spacious with a lovely sized pool which my boys spent every day in at some point even on the one rainy day. I'd recommend Namo's restaurant which is a minutes walk away and a vist to Paphos Zoo, the Sea Caves, Akamas peninsula are a must do plus in the evenings Coral Bay is within a very short drive or a very reasonably priced taxi fare away. Thank you Phil for your review! It is a great area, less touristy than some and yet not so far away from that kind of action if you want it. I'm delighted you & the boys had a good stay, you're welcome back any time. We really loved our stay here. This has Villa has everything you could possibly want. Maria the owner couldn’t have been more helpful. I highly recommend it. I'm delighted you loved the villa and the area. All the best to you & your lovely family. You're all welcome back anytime. Fantastic villa with everything you could need. We had a fantastic time at this villa from the moment we arrived to find chilled wine and beer along with a platter of delicious dips. Maria had thought of everything to make our first night easy even providing milk and bread. The villa was gorgeous, the photos don't do it justice and the outside space really sets it apart from other villas. We had many happy and relaxed times in the pool. There was everything you could possibly need included. It was really clean and fresh, the pool was cleaned early in the morning several times each week and the villa was spotless. Maria and Andrew were really friendly and couldn't do enough to be helpful we were given numbers to contact if we had any problems or queries. They had lots of advice about things to do and places to eat. We will certainly book this villa again. Thank you Sharon for the stunning review. Unfortunately many owners employ third parties to clean and manage their villa's and the attention to detail just isn't there! Thank you for your appreciation of our hard work & thank you for leaving the villa super clean yourselves. You and your lovely family are welcome to return anytime. All return guests enjoy a discount too. I had already spent 8 days in Polis before moving down to Maria's villa for the rest of my holiday. From booking to arrival, Maria was so helpful and let us know that the villa was ready for an early arrival if needed. Directions were simple and we found we were in a lovely, quiet cul-de-sac, with easy access to the main road. The villa is really well presented. A huge open plan kitchen, diner, living room leading out to the big garden and welcoming pool. Maria popped round and provided us with a welcome pack and had prepared a map for us for some good walks in the area - you're right at the entrance to Akamas. I'd recommend a decent 4x4 to explore further into it though. St George's Bay is a short walk and Sunset Restaurant is along the way. Very friendly and great food. There's an hourly bus service into Coral Bay and we may use of that and further to Paphos a few times. Maria and Andrew were great hosts and I would happily recommend their lovely villa for a relaxing break. The St George area does have some fantastic walks. The coastline is rugged with some amazing rock erosion and sea caves, plus the villa is conveniently placed to explore in to the Akamas and walk through the Akavas gorge. Additionally from Coral Bay the bus service to Paphos from Coral Bay is every 10 mins (summer) and every 20 mins (winter). Bus prices are fixed, €1.5 per day journey or €5 unlimited journeys per day. Great for those leaving cars in St George to enjoy a drinkie or three in Paphos. We are super flexible on arrival and departure times. If there is no prior or follow on booking or the next booking has a late arrival we will happily allow our customers to arrive early or stay on longer. Little things like this are no skin off our noses and can alleviate the travelling stress, especially for family bookings with young children in tow. We'd happily recommend your respectful family to any villa owner. Stayed here in August 2017, we arrived late on a Sunday night, a little tricky to find if you're not familiar with the area but Maria's directions were easy to follow. On arrival there was wine and beer on ice along with essentials in the fridge, Maria even made up a little platter for us which no one has ever done before, she really puts a lot of effort into your stay. Villa is absolutely immaculate and had no problems here at all, if we were to have a problem, Maria is only down the road or a text/phonecall away. Coral bay literally only 5 minutes or so by car (car hire I would say is essential for convenience). Would definitely stay here again and would highly recommend to anyone. It was my pleasure hosting you and your lovely family. Thank you for the fab review & thank you for leaving the villa so super clean! I recommend that owners reading this review accept your booking as you are amongst the most respectful guests we've ever encountered. You are welcome to return anytime. Thank you! ......& my best regards from Sunny Cyprus. 10 minute walk to secluded beaches, a 3 minute drive to the sandy beach at Coral bay. The nearby coast line is reputed to be amongst the most beautiful in Cyprus. The area is known as the 'Sea Caves'. Car hire is recommended for the location of the villa, although not essential. Paphos International Airport is approx 40 min drive away, Larnaca approx 2.5 hrs drive away. St George village is a short walk away, Peiga village is a 2 minute drive and Coral Bay a 3 minute drive. The location of the villa is perfect for any visitors interested in walking or cylcling holidays. The combination of exciting coastline and the outstanding beauty of the Akamas conservation area is superb. A European Cycle route (E4) through the Akamas mountains starts a short distance away.